Now the intercooler internals have been cleaned, it's time to start re-assembly of the thing. Here you see new gaskets for the covers in the making, made from 3mm neoprene. The gaskets had to be replaced as the old ones came apart when I opened the covers. I would have made new gaskets anyway, as the old ones had no 'spring' left in them at all. It started out a relatively clean job, on account of Fred's careful cleaning of the covers, but that dirty oil gets everywhere. In advance of completing the woodwork down below, I'm now experimenting with varnish. You should only attempt to varnish any surface after fairing the wood, with ultra fine sandpaper, so well that it's almost worn through completely. Oh yes, and you must sand with the wood grain or else the wood will end up scratched. The workplace must be warm and completely dry. Not too hot mind. Also, you should scrupulously clean not only the workpiece to be varnished, but the whole room to ensure the place is completely dust free before starting. It's best to use white spirit for this. After cleaning, it's best if you can leave the workplace hermetically sealed, and undisturbed, for at least two days, so that in the unlikely event there is any remaining dust, it settles completely. 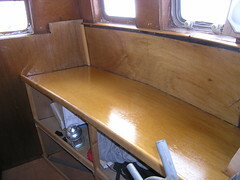 To varnish, it is important to wear a full body set of coveralls, which are both dust and lint free. Adequately covering for your hair is particularly important. The varnish should be gently heated to 21.5 degrees centigrade, but no more than 23 degrees, so it flows best. A warm bath works well here. To use it, the varnish should be decanted into a suitable container, to prevent contaminating the varnish tin with that used brush. Then, and only then, should you apply the varnish, using a brush with bristles made from the underbelly of virgin Japanese badgers. Use long, flowing strokes and keep to the recommended coverage per square foot, or metre, depending on your preference. The varnish must also be stirred continually during the varnishing procedure. It's best to start each new coat with a new brush for that perfect finish. Of course, while varnishing, you should always move slowly around the area you are working in, to avoid raising dust, and you should not allow anyone else anywhere near until the varnish is completely dry. After varnishing you have to sand everything off, with even finer sand paper, and then start again with the whole dust free thing. Do the above several times, of course, to get the best possible finish. Incidentally partially used varnish tins should be stored upside down, and at an angle, to prevent leakage or 'stalactites' from forming. Hmmm, this is Lady Jane we are talking about. A more pragmatic approach is required here methinks. Here you see the results of my first ever attempt with varnish - obviously I didn't heed any of the advice gleaned from the Internet here. I love these before and after pictures. Here you see the fruits of the last few weekends effort, in stark contrast to where I started from. I know it's not all gleaming copper right throughout, but nevertheless it's pretty good considering. This trail was originally started with the discovery that there was no pressure being generated by the turbo. Until Robin took one of the gauges off while the engine was running, nearly a year ago now, I had always assumed the turbo pressure gauge was defective. It took servicing the turbo to determine that the problem was most likely a partially blocked intercooler, and not the turbo, that was causing the lack of manifold pressure. Now with a fan blowing on one side of the newly cleaned intercooler, I can feel air flowing through the other side of the thing perfectly fine. My expectation for good turbo pressure with the engine running is high here. 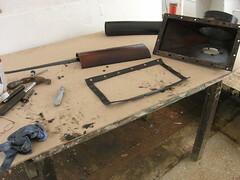 The job is not yet over though, as gaskets need to be made and the casings need to be put back on. I think I'll put the turbo side casings on, but leave the other side open when I first run the engine. That will ensure that any loose 'bits' will get blown out of the side of the intercooler, rather than into the engine. Once the engine has been run for a bit, I can then put the final cover on and re-start the, now, turbocharged engine. Finally, the intercooler insides have been cleaned. Here you see the intercooler cleaning apparatus at work. That window is filled with cleaning solvent as it runs through the system. I'll post a before/after picture of the intercooler tubes tomorrow. In the event, once the cleaning solvent had been running through for a while, cracks started appearing in the covers. I suspect temperature differences played a role here. With a change from dirty cleaning fluid to clean, the cracks opened up even more. Eventually prudence dictated when to stop with the cleaning, as one of the cracks finally started to leak. All in all, I guess I ran cleaning fluid through the intercooler for a good few hours. That intercooler is as clean as it's going to get, short of taking if off completely and getting it professionally seen to with ultrasound cleaning. It's not only the engine that is getting my attention these days. 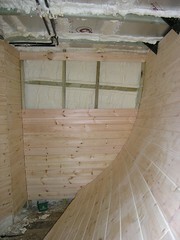 Here you can see progress with the woodwork down below. Although fitting the shapes of wood to the curve of the hull looks hard to do, this is actually quite easy in comparison to the tricky bit I was working on before this. Oh and before you ask, as far as I can tell it's all in pretty straight. 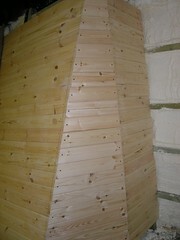 It's hard to tell as, depending on the angle you look from, it looks like the wood slopes either one way or the other. It's actually very satisfying working on this bit, as once in a rhythm things move along pretty quickly. 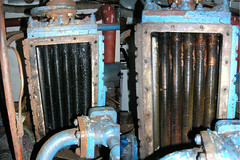 Here is a picture of the intercooler cleaning apparatus from the other side. It would have been so good to show a picture of brilliantly clean copperware inside the intercooler, sadly this is not the case just yet. Overall, it's fair to say that the whole mechanism worked exactly as planned, that 20 odd litres of solvent went very dirty pretty quickly, except for massive leaking from the seals round the edges. What impressed me the most, and encourages me to persevere, was the rate of flow of the solvent through the system. As it turned out, the pump could easily match the pace of the solvent flowing out the bottom of the system - I used 15mm piping (1 1/4 inch I think), except for the pipe from the pump which was thicker. 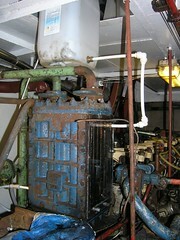 The pump I used was an old bilge pump, rated at 500 gallons per hour (with no head I presume), with a float switch. 1) The bolt holes have to be positioned exactly right, else cracking in the perspex will occur. 2) Patience - let the silicone seals dry properly before doing anything, or use proper gaskets. 3) Perspex bends under the slightest pressure, so use ALL the bolt holes (see 1 above then look at yesterdays picture again). 4) With the system properly sealed I need a separate vent pipe to facilitate filling/draining the system. 5) Test the system with water before using expensive solvent. So all I've achieved so far was to make an even bigger mess in the engine room than before. At least it's relatively easy to clean up. Of course I think the intercooler pipes look somewhat cleaner. Version two will work out far better. Promise. So here's the somewhat Heath Robinson device I've made, with Fred's help, to flush out the internals of the intercooler. This is based on the idea posted anonymously last week. This picture is obviously taken before filling the system. You can see the 'header tank' at the top, with pipework leading into one side of the intercooler, and the drain pipe out the other side. You can only just see the pipe from the pump, which is sitting in a bucket, as it loops past the drain pipe valve back up to the header tank. In the event, cutting the perspex plates and setting up the pipework proved to be pretty straightforward. All this was completed before a slightly late lunch. I'll post the results of our handiwork tomorrow. On a separate note, there has been some comment on the piping blanking flanges to and from the intercooler. These have been there like that since I've bought Lady Jane. My assumption on the blanking plates is that they are there in case the seawater flow through the intercooler needs to be shut off for some reason. 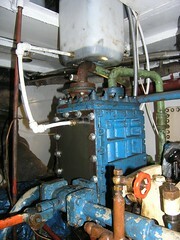 Maybe a repair while at sea with the engine running, or blanking off in case of a seawater leak into the engine while under way. 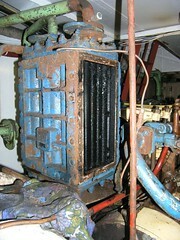 There are a few of these blanking plates built into pipework elsewhere on Lady Jane. So thanks to everybody for the feedback on my last posting on the intercooler. 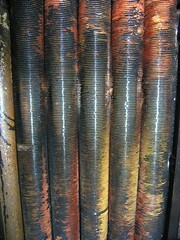 So here is a picture of the pipes after an initial couple of blasts with the spray cleaner. Actually about an hours work. A truly filthy, stinky, job so far, with the inevitable mess splashed about on Fred's pristine paintwork. I hasten to add that the damage to the fins was there when I opened the casing, and was not done by me. Obviously someone else has been in there before me. With a bit of cleaning, I was somewhat surprised to see the pipes and fins appear to be made of copper. I had originally intended to continue to use the spray cleaner to get an ok job done, until reading last night's anonymous post. The suggestion was I make up perspex covers and flush cleaner fluid through the intercooler using a pump. That flushing fluid idea is so simple and elegant, but should prove to be extremely effective, that I think I'll give it a go. I have pretty much everything I need to hand - just need to buy a few tank fittings for the perspex covers and I'll be away. I know it will take longer, but the job will be so much less messy and will most likely be worth the extra effort in the long run. Thanks again to whoever it was that made the suggestion. Here's what the inside of my intercooler looked like once I had the covers off. The fins on the pipework are much more detailed than I was expecting. It's easy to see why the air has not been getting through, with those years of grime that you can see built up there. I get the impression that these covers have probably never been taken off, or certainly not very recently. The cover on the port side was particularly reluctant to come off, in the end I had to resort to violence and so ended up breaking the, pretty substantial, gasket in the process. One thing I had done was invest in a cheap air ratchet via eBay, on account of the sheer number of bolts that needed undoing. That air ratchet at least made the task somewhat easier. 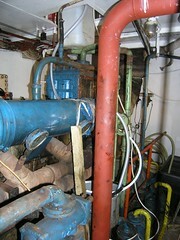 The plan is to clean the built up oil and grime on the internal pipework using a spray gun which I've got kicking about. Flushed with the success of painting with the blue, I set about starting on the tricky bit down below on the port side. 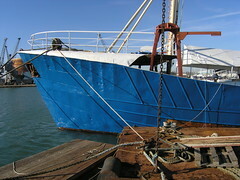 Fred, in the meantime, made a start with templating on the starboard side. As I said before, this time I'll start putting in the wood from the bottom. 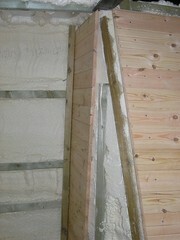 Because of the way the wooden battens lie, this side is quite different to the other. So there it is, all blue. There is not much for me to say really, other than this has been a long time coming. For the first time in years and years, Lady Jane is now the same colour all the way round. Not the end of all the painting on the hull of course, but a significant milestone nevertheless. I know it's going to be a while before the wood panelling is completed down here, but now is the time to start thinking about fitting the place out. Andy happened to bring down his newly acquired hammock, which has me thinking maybe I get a few for myself. The bottom line is I have still not decided how things will fit together down here, thinking I would need the services of some kind of boat interior designer to help. It strikes me that hammocks would give considerably more flexibility to this space, as they are easy to set-up and stow. This leaves so much more living space for daytime use. 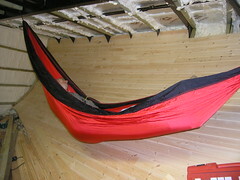 Hammocks also mean that this place is usable right now for visitors to sleep comfortably, while the fitting out continues. It also occurs to me that napping up above decks in the warm spring sunlight in a hammock, with a gin and tonic to hand, could be pretty cool too. It's obvious really, hammocks and boats are made for each other. So here is the result of all the effort on that corner piece. My plan is to work over the edges with a sander and, if Andy's calculations are correct, make a smoothly rounded edge there. I suspect there will be some infilling with sawdust and glue, but overall I'm hopeful of a really clean edge there. If not, I'll simply cover it over with some beading. Do I think this bit has been worth the effort? I'd say yes. Though in reality, like so many other newly attempted things on Lady Jane, only time will tell. 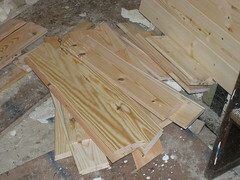 So the sorry pile of discarded sawn pieces indicates progress with the tricky bit, of sorts. Despite my best efforts, and having a worked example sitting by the mitre saw to copy, I still managed a pretty impressive pile of wood cut wrong for one reason or another. Having all those angles on each piece being cut does my head in! I have at least learned that when I start the next side, the port side, I will start from the bottom and work up. That way, if a piece gets cut too short I have a chance of using it a little higher up. As to how to avoid cutting the pieces wrong in the first place, I have no idea. Other than to concentrate more on the job in hand. That old, probably now politically incorrect, joke about having to retrain the work force if they have had too long a break comes to mind here. A while ago I wrote about the sorry fate of the Abundance. 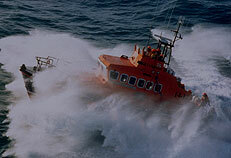 Here's the story from the RNLI perspective. A brave rescue in what sounds like desperate conditions. There are obviously lessons to be learnt here.